If you are not sure about the proper griddle temperature for pancakes, making a refined breakfast for your family can be a little challenging. Fortunately, this article is going to introduce a few important tips to conquer this morning meal and to win over the taste buds of even the pickiest of eaters. Below you will find a few great tips to make your morning a little bit easier, and even a recipe for pancakes so you have a great foundation for a memorable breakfast. You cannot cook great breakfasts (or any meal for that matter) without the right equipment. 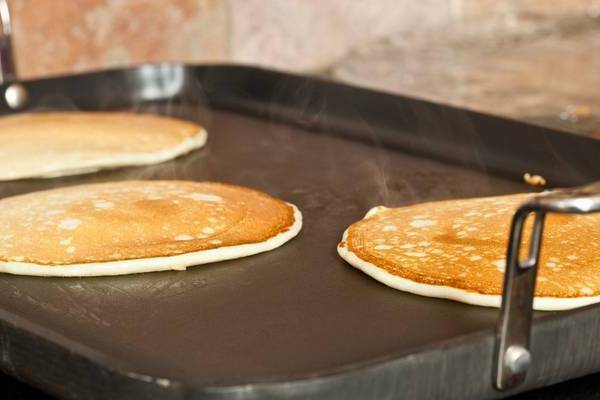 While many might argue that griddles are not deemed a necessity for making pancakes or other breakfast foods, it does make the process a lot easier. 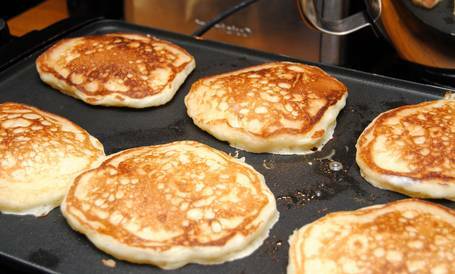 To make perfectly cooked pancakes, you have to have a working knowledge of a temperature range that you are cooking in. For pancakes specifically, you want to work right around 375 degrees. This is easy to determine with the use of an stainless steel electric griddle for home use by simply setting the temperature. There is a common misconception when it comes to novice cooking that lack of skill can be made up for with heavy seasoning. While there is certainly a place for certain spices (in moderation) in your cooking, you simply cannot take the burn out of overcooked food by slathering it with various herbs and mixes from your spice rack. Ultimately, getting better at cooking takes time and it takes some mistakes, but better to throw out a ruined dish than to make it worse trying to salvage it. An emerging trend in the kitchens all over the world is to take all of the art and concentration of cooking out the equation altogether. Devices and gadgets are performing tasks like hard boiling eggs or cooking bacon for this breakfast we are discussing. While it might seem like it is saving you some time, many of these gadgets simply do not have the end result that legitimate cooking offers the chef or those eating the food. For those that struggle with the basics of making food from scratch (don’t worry, everyone was where you are at some point), here is a great pancake recipe that will help you make a delicious breakfast. Step 1 – Take a large mixing bowl add the dry ingredients. Whisk the flour, baking powder, sugar and salt together. Next, whisk in the butter, milk and egg to this mixture. Continue mixing until the entire bowl is a moistened and uniform batter. Step 2 – Begin heating your electric skillet or electric/stovetop griddle to roughly 375 degrees. You can test this by letting a drop of water hit the surface. If it sizzles, you are hot enough to properly cook pancakes. Using your vegetable oil, lightly brush the surface of your griddle or pan. In ¼ cup scoops, pour the batter onto the cooking surface, spreading it to roughly four inches. Step 3 – Pay close attention to the cooking of the pancakes! When they are dry around the edges, take a spatula and flip them over. You will want to cook them for an additional 2 minutes (or until the entire pancake is a golden hue. As you continue to cook further pancakes, you might determine brushing more oil is necessary. Hopefully you were able to get a few helpful guidelines to making better use of your kitchen to make your family breakfast in the mornings. Since breakfast is the most important meal of the day, make sure the people that you care about have the right start to every day. 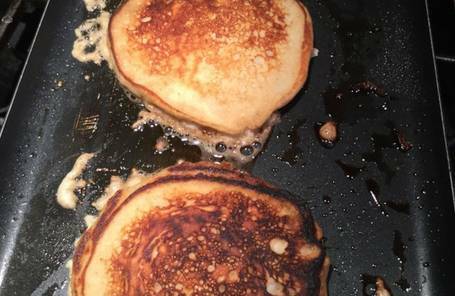 While it might go well beyond knowing the right griddle temperature for pancakes, having confidence in your kitchen can dramatically change the way you cook. Visit our The Perfect Griddle Temperature for French Toast And More for find out other cooking tips.